Big surprise, Las Vegas gaming revenues are down and Millennials are to blame. At least, that’s what the numbers say, right? One of the regularly cited statistics regarding Millennials and gambling comes from a 2015 UNLV Center for Gaming Research study. In it, UNLV found that in 1984, gaming made up 58.63% of revenues on the strip but have declined every year since, reaching a low of 34.90% in 2015. 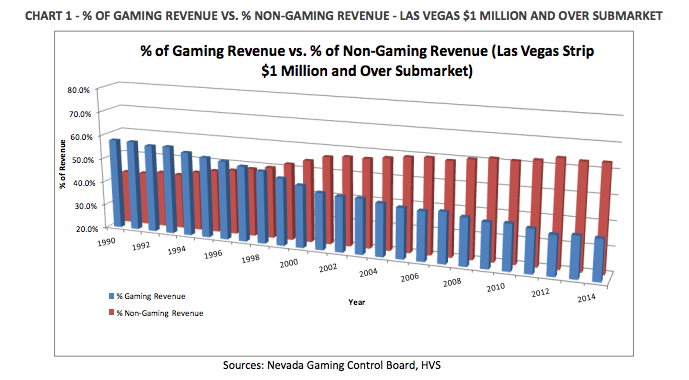 Sarcasm aside, we can clearly see that gaming revenues in Nevada started to decline in the mid to late-90s before being overtaken by non-gaming revenues around 1999. This means gaming revenues started to tumble when the first Millennials were not even old enough to walk into a casino. Where Did The Problems Start? 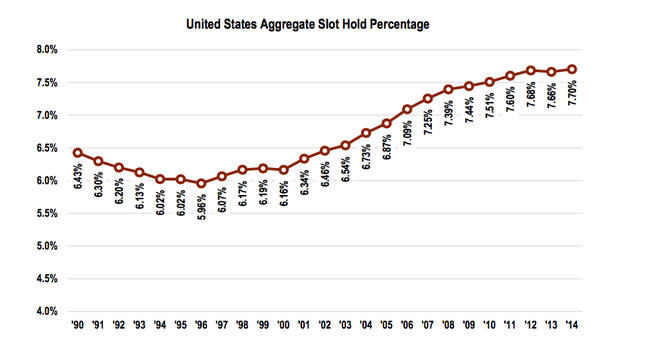 Before we dive into Millennials specifically, let’s examine the modern history of gambling in the United States. Nevada legalized most forms of gambling in 1931, New Jersey followed suit in 1977 and in 1988 the Indian Gaming Regulatory Act allowed tribes to offer gaming on their reservations. This means that prior to 1988, the ONLY places in the U.S. to gamble in a casino were located in Las Vegas and Atlantic City. Today, gaming in the U.S. is a $70B+ industry that includes over 1500 properties. Casinos have never been more accessible to consumers. 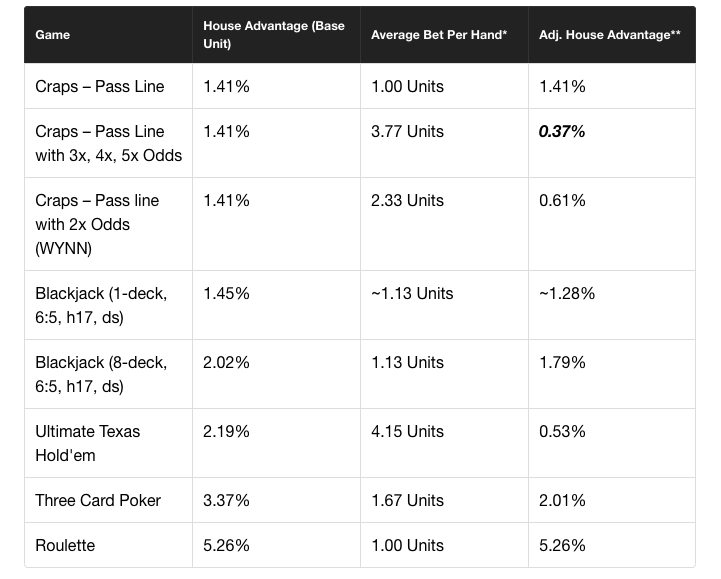 On top of increased competition, casinos have also been active participants in their own demise through decades of steady house-advantage increases. To this per The Motley Fool. 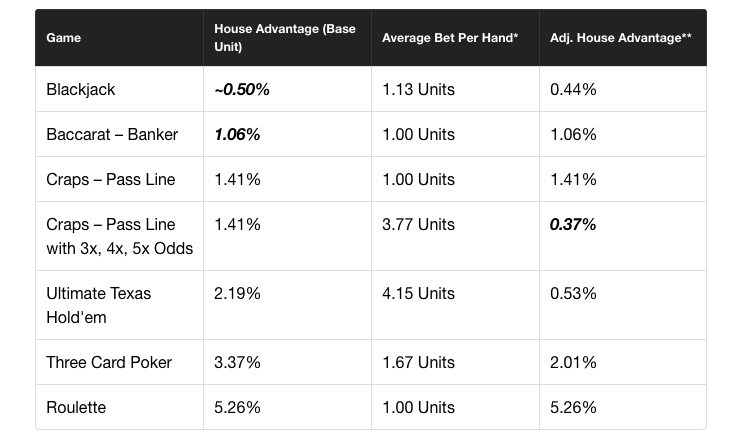 “Casino gambling in general has matured, and Millennials (and the rest of America) are doing what you would expect people to do when they become more knowledgeable about gambling — gamble less,” says The Motley Fool. In the past, this would’ve flown under the radar for casual gamblers. In the information age, this is incredibly easy to read about and consumers aren’t having it! None of this is to say that there aren’t differences between Millennials and older generations. The point is that blaming Millennials for declining gaming revenues would be an egregious overstatement. There are a number of external factors have have led to the decline in gaming revenues in Las Vegas, most of which originated before Millennials were old enough to be on the casino floor. But What About The Millennials? There certainly are differences between how Millennials plan their entertainment versus their older counterparts. The Stockton University Millennial Entertainment Preferences Study highlighted a 21% difference between the importance of gambling between Millennials and those over the age of 35. 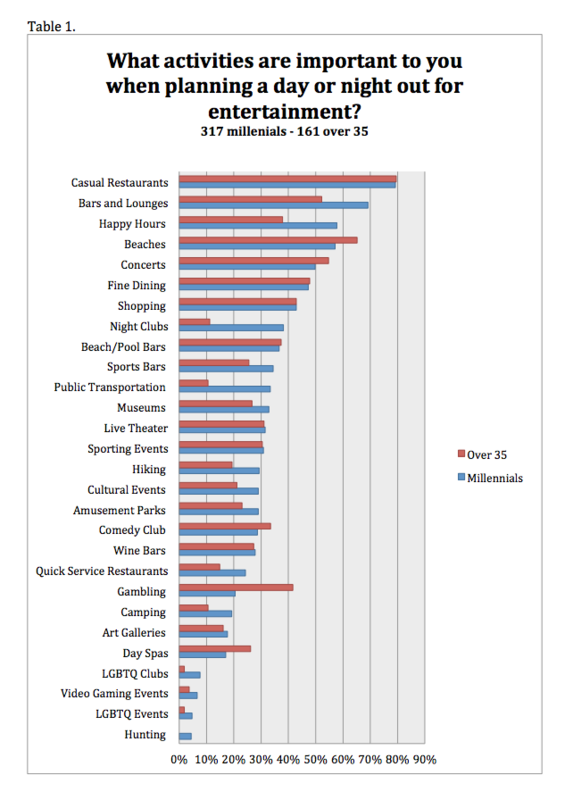 Out of 28 activities, gambling ranked 21st in importance for Millennials vs. 7th in importance for Non-Millennials. 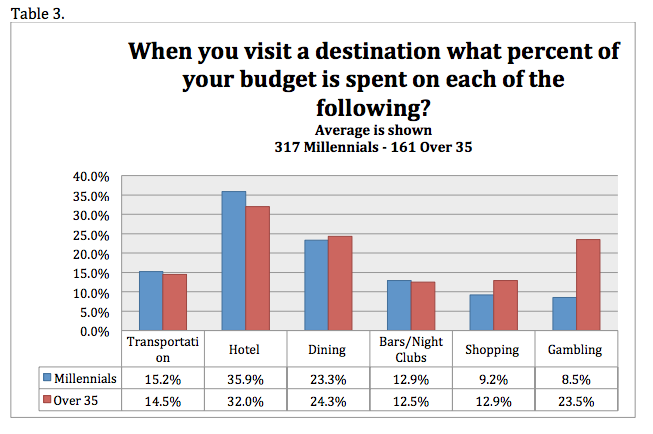 In fact, Non-Millennials tend to spend 23.5% of their entertainment budget on gambling versus just 8.5% for Millennials. 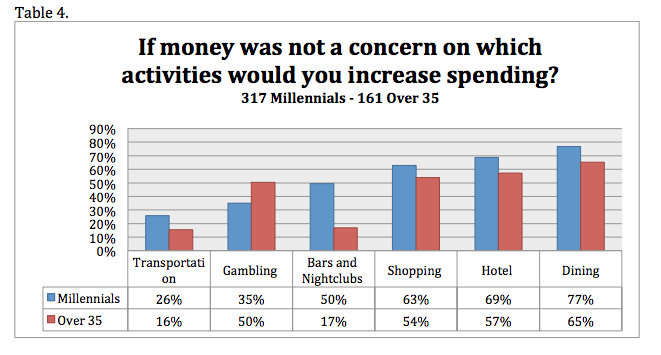 And, even if money was of no concern, Millennials would still allocate money towards lodging, dining, shopping and going out over gambling. “What’s happened in the past three decades is not that there is inherently less interest in gambling on the Strip, but rather that the market for Las Vegas has broadened beyond people who only come here to gamble,” says The Motely Fool. “Those people…” are Millennials. Saying Millennials don’t gamble because the percentage of total revenue from gambling generated on the strip has declined is just not true. It’s a convenient usage of a statistic to try to prove a point which may have a correlation, but not causation. In 2015, the state of Nevada brought in $10,622,398,628 in gambling revenue, which is the third highest amount in history, only surpassed by 2007 & 2008 figures. In 2015, Nevada Casinos generated the most revenue in history at a staggering $24,591,388,351. Yes, those figures are in the BILLIONS. Day parties, night clubs, restaurants, shows, and the hotels themselves are now the draw. And that’s not surprising. Many Millennials left college during the recession with crushing student loan debt and the highest house advantages ever. Can you blame them for spending their money on other forms of entertainment? I can’t. Do you know of any other research on the topic or have any more thoughts to add? Leave a comment below or shoot me an email and we’ll chat!